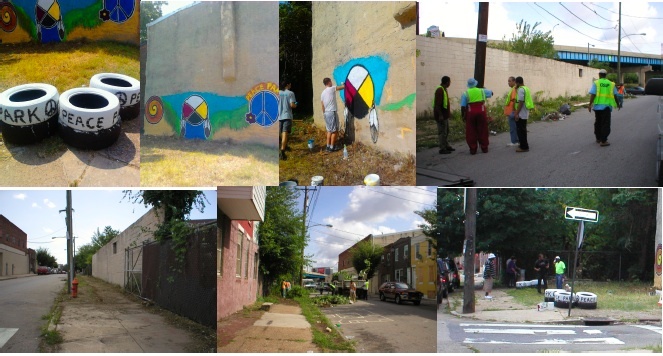 Art Sphere Inc. organized several Gray’s Ferry Neighborhood Cleanups and Mural painting events, with the help of neighbors, volunteers, and city sanitation agencies. 1. Abandoned Lot and home – Neighbors complained of graffiti on the side of an abandoned home used for selling drugs, drug usage on neighboring abandoned lot. 2. South Corner view– This project was overwhelming for neighbors and local business owners who tried contacting groups and delinquent neighbors for assistance over the years and felt hopeless and ignored. Parents feared for their kids as they were unable to walk on the sidewalk and two raccoons were spotted on this section of 32nd and Latona Streets. Additionally, homeless living existed in the back portion. Hidden under trees and behind weeds were blankets and cushions. 3. North Corner view–Looking toward Grays Ferry Street were grass weeds and trees making it impossible to walk on the sidewalk while it was also dangerous for over 10 youth living on the block to walk on the heavy car traveled 32nd Street. 4. Human Waste and other Illegal Dumping- Industrial debris from cars dumped here as well as over 12 tires. Additionally, neighbors removed several old trees that were risking their safety and possible further damage to the foundation of next door abandoned home and passersby. Clearing out ragweed (and plants associated with allergies and asthma) and a bag pond where stagnant water was breading swarms of mosquitoes. These positive outcomes further improve the quality of life for neighbors and children of Grays Ferry. 5. Medical Waste, Needles, and drug baggies- The Mayor’s Office of Neighborhood Services assisted us by bringing in teams and equipment to remove several truckloads of trash, human feces, drug needles, other paraphernalia, homeless bedding, and more. They also cut back an incredible amount of overgrowth of plants and trees that blocked usage of the sidewalks on Grays Ferry and 32nd streets from Grays Ferry to Wharton Streets. 6. Finished mural and Cleanup of Park- When we went door to door asking for neighbor involvement and assistance in naming the park, there was much talk of a negative history of the neighborhood. 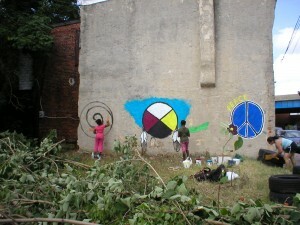 Beautifying the wall with a “named” mural, a Native American medicine wheel (celebrating all peoples’ healing, directions, and ages), and peace and universal life spiral symbols established the lot as “Peace Park”. Clearing the area of signs of drug dealing and homelessness and replacing it with safe outdoor green space provides a message of hope to ten youth living on this block. 7. Getting the City Involved- By Art Sphere’s invitation, the city also cleared another abandoned, overgrown, and trash filled lot across from “Peace Park” on 32nd Streets. Graffiti was removed on one brick building and graffiti was covered on the corner fencing traveling west on south side of Grays Ferry from 32nd. 8.Board Member, Volunteers, and residents Lend a hand- Transforming an entire city block was difficult work and our board member, Priscilla, her children, dedicated neighbors, and Art Sphere Inc made a great team! Priscilla plans to possibly get Cultural Education and Events members of the Lenape Nation to come out and participate in a fellowship ceremony. 9. Volunteers, Neighbors, Local Businessmen, and other organizations assisted- This was an opportunity for neighbors and other groups to get to meet each other while cutting down trees that were cracking the foundation of an abandoned building. We are excited to keep the cleanup and creativity spreading, working within Grays Ferry with other neighbors from nearby blocks, planning our next “Reed Street” mural project (Art Sphere having already delivered paint for it). BME Challenge “Be Me” (celebrating African American Men who are active in community) also came out to join us and made video interviews of our hero, Lenard, who also provided tools and manpower the previous Saturday. 10.Reuse of Tires for Future plantings- Knowing we had group support and expertise helped make obstacles of trash, graffiti, and overgrowth seem a lot more manageable. We were able to make the abandoned trash filled and graffittied corner lot at Latona and 32nd Streets into a “Peace Park”. With the assistance of four creative PFF Philly Food Forests volunteers, we painted the neighborhood’s abandoned tires that we couldn’t remove for future planters and created a wonderful park border. 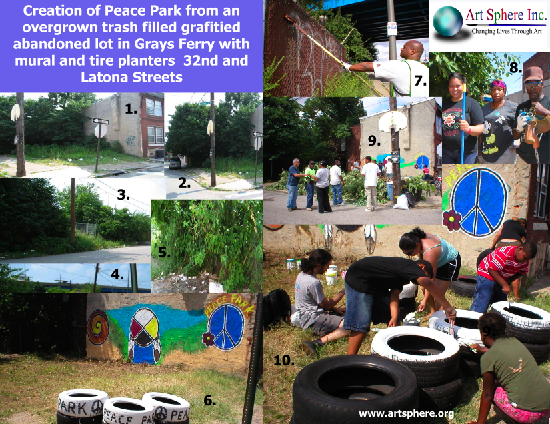 Below are quotes from Art Sphere, Inc’s Peace Park (Latona and 32nd St.) Project Volunteers! “Thanks so much for coming and helping out our block, we really needed this on our block I really deeply appreciate this. If it wasn’t for you coming and asking about the murals, We wouldn’t have came this far with out your help. We really hope that we can always be in touch with you because you really made a great difference in what we have been trying to do for 10 yrs or more. I’m really looking forward into helping our block and other blocks in the community be a better place to live. Again thanks so much and looking forward in this Saturdays events.